Sante Brattisani was the first-cousin of Valentina Brattisani Quilietti. 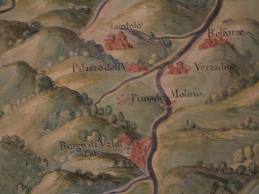 Many of the Brattisani family had moved from their home in Emilia Romangna in northern Italy and settled in the towns of Scotland. We find them from as far north as Inverness to regions of Fife, Glasgow and Edinburgh. 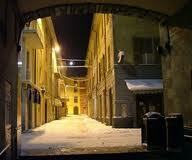 But they are all related and from the villages surrounding the city of Parma. 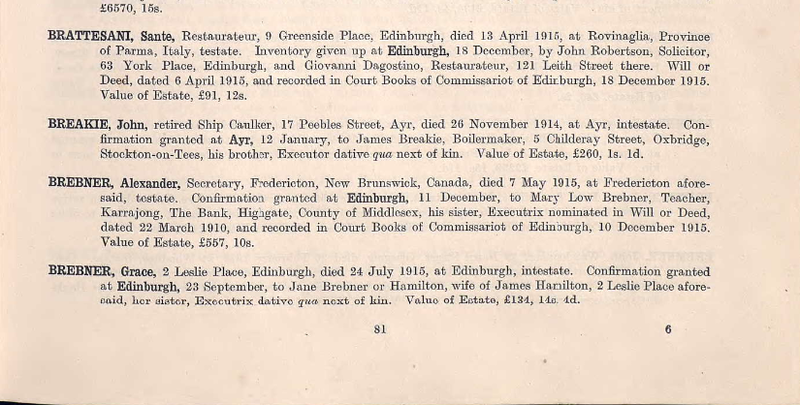 This extract is taken from a book found in Edinburgh Room of the Library called Leith Walk and Greenside. 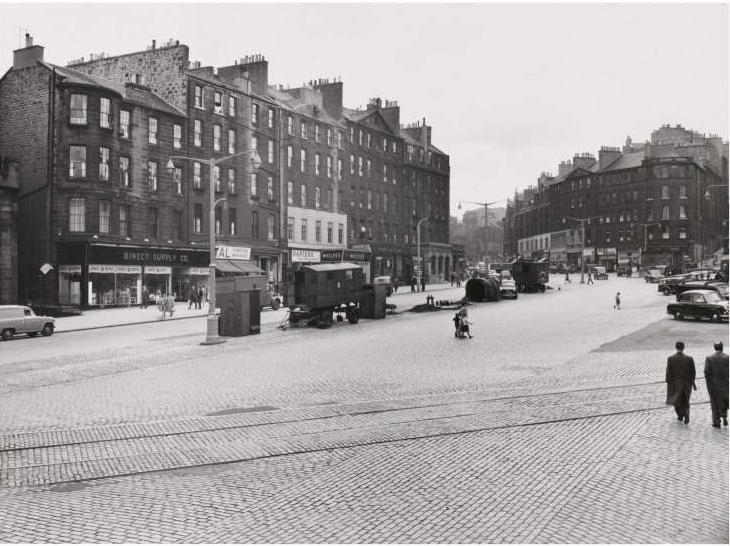 Sante Brattisani had moved to Edinburgh at the turn of the century and found work in the shops of his uncles and cousins, helping in the ice cream manufacturing business which Emilio Quilietti had started up in Edinburgh, or in the chip shops of his uncles. We first locate him in the 1901 Edinburgh Cencus living at the address of his cousin Valentina Brattisani Quilietti. 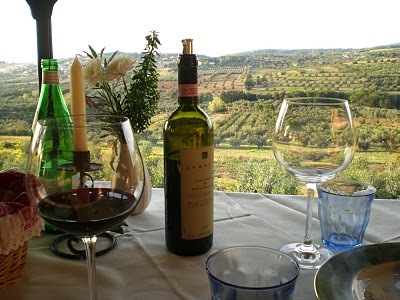 Sante was born in the year 1875 in San Vincenzo which is a village in the territory of Borgo Val di Taro, Parma, Emilia Romangna, Italy. It is the tiniest of villages with only 54 inhabitants living there today. It rises above sea level at 663 metres. 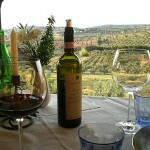 The piccilo village lies close to Rovinaglia and also near the village of Brattesani. These villages are the roots of the Brattesani family. Sante’s parents were Angelo Brattisani and Maria Delgrosso. Sante was the eldest of the family and we have traced two other brothers Giuseppe born in 1879 and Celeste born in 1884. These brothers all came to Scotland. After the death of Emilio Quilietti his wife Valentina Brattesani moved from 24 Greenside Place to 9 Greenside Place, just a short walk up towards the centre of town. The year was 1900. By 1901 she had an extended Italian family living here with her. 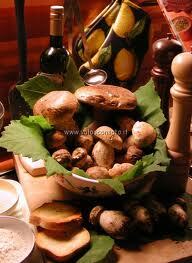 There were her four surviving Quilietti children, her parents and sisters and also her uncles and cousins from Italy. Emilio had built up a small ice cream/chip shop business before his sudden death at the age of 29. He had 8 small shop premises in 1898. It was then perhaps to merge the family interests that she re-married on 30th April 1901 in St. Mary’s Cathedral to her first-cousin Sante Brattesani. This coupling however was not to turn out good at all for Valentina. She had already lost two Quilietti babies between the death of Emilio in 1898 and 1901. After her subsequent remarriage four stillbirths were to follow. One child Mary was born in 1902 but died shortly after birth. The fact that they were first-cousins surely contributed to this very sad episode in our history. 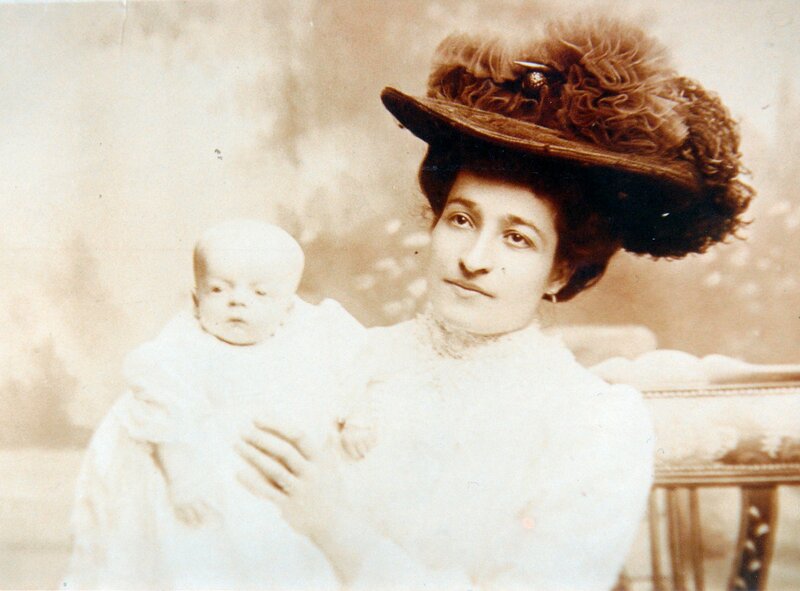 Valentina did not survive the last stillbirth and following complications she died in 1905 at home at 9 Greenside Place. Sante buried her in a plot in Easter Road Cemetery beside her stillborn children. He erected a memorial stone for her. Her parents are also buried here. Emilo lies opposite in what is now an unmarked grave. Sante now had a free hand and had inherited her estate. 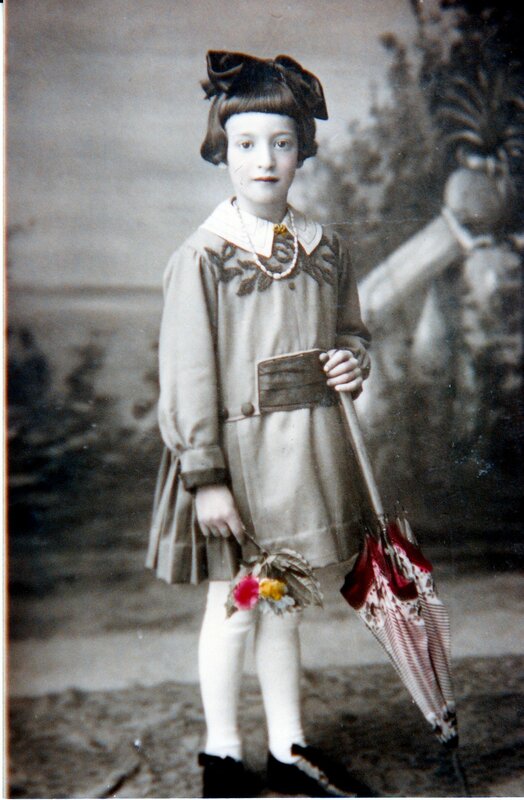 The Quilietti children were now being brought up mostly by Louisa Brattisani their aunt. Sante travelled home to Italy without any of his stepchildren soon after the death of Valentina in 1905. In Italy on 7th November 1906, one year after Valentina’s death he married a girl from his home village. Her name was Louigia Perruzi. Gina as she was affectionately known was born in the year 1882. She was seven years younger than Sante. They married in the village Church in San Vincenzo on November 7th 1906. This village is where many of the Brattesani family came from. Gina’s parents were Igino Peruzzi who was a publican in the village. Her mother’s name was Maria Canali. After their marriage he brought her back to Scotland and here in Edinburgh he married her once again Their witnesses were Angelo Cardinal and Michelangelo Rizza who were both ice cream dealers in Edinburgh We are unsure why the couple remarried but it was probably for legal reasons back here in Scotland. The following year their children started to arrive. Angelo was born in 1908 and died two years later. Ettore was born in 1910 and died in 1912 Sante was born in 1911 but died in 1912. 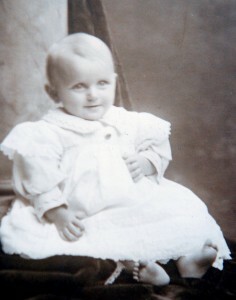 Eva Louisa Teresa was born in 1913. The children were all born at 9 Greenside Place, Edinburgh. The 1901 Scottish Census gives us a wee bit more information about the Peruzi family. Louigia had two brother Carlo and Ettore who was born in 1877 and 1882 respectively. 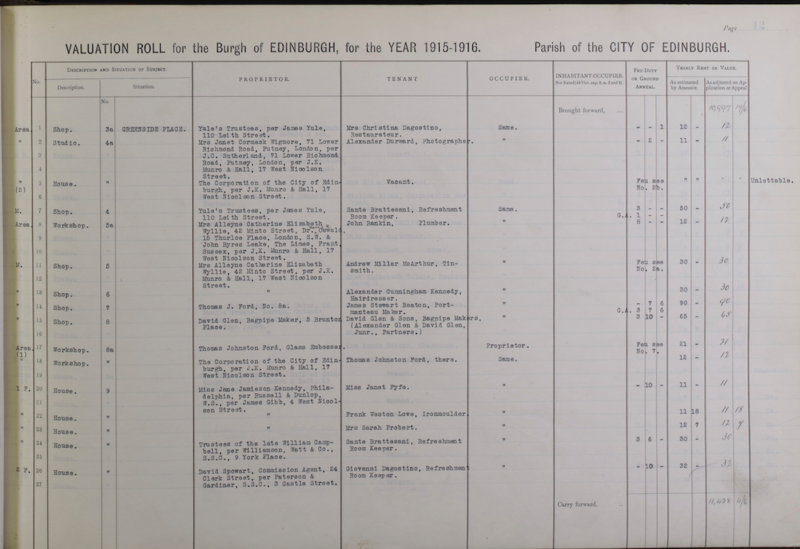 This census shows them working in Methil in Fife with their cousin………….Brattesani who was described as the head of the famil and Restraunter. 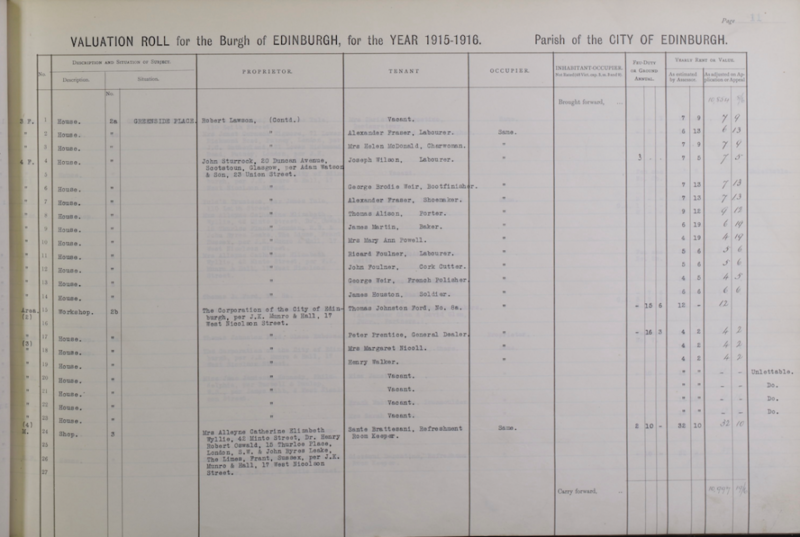 Looking over the Sasines Register here in Edinburgh we know that Sante had various premises and workshops in the immediate area. 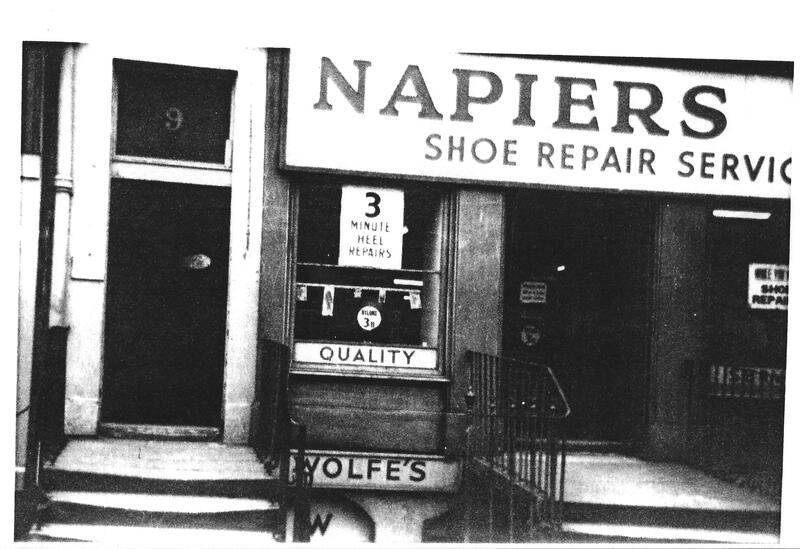 He had a double shop at 4 and 5 Greenside Place, the shops directly underneath their flat on the main street. This was described as a Refreshment Room. These establishments were a new style of social engagement and were springing up all over the area. 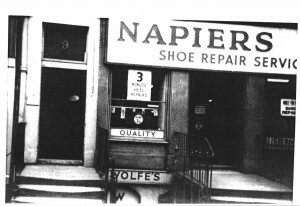 He also had shops in 8 and 11 Union Place, directly opposite the Playhouse Theatre. One of these premises was described as ‘machinery’ where he would have made the ices. The other premises he was a Proprietor, not a tenant like in the other premises. Because we now know that our Sante returned to Italy and died in 1915 we must assume that his cousin Sante Brattesani had assumed ownership of these shops. Can any of the Brattesani descendants help us in our family quest and fill in the missing parts of this very sad episode in our family history. As a post note September 2016 have found the death of Sante Brattesani. He died in Borgo Val da Tori in April 1915. Very sad. Special thanks to Luigi Tagliavini who is a son of LUISA BRATTESANI and who has kindly given us the information about the home villages of the Brattisani family. His grandfather had travelled to Scotland frequently to work in the shops of his relations in Glasgow, Edinburgh, Fife and the North. I hope that he will help us some more and give us a wee bit information about the Brattisani family of Borgo Val di Taro, Parma. Thank you Luigi.